All my adult life has seen me trundle up and down the main roads of the UK. Grinding along the M6, near where I grew up; ploughing down the M1 into the centre of London, or along the A303 in my early days in sales. But a funny thing happened last week along the route to the south west, the M5, a road with strong memories for me; of holidays, of University days, of caravans and entertaining mechanicals in the pouring rain. I wasn’t stopped in my tracks by excess traffic or road works this time though, but rather by a startling brand experience. Let me return to that shortly, and start with the context. I’m from a part of the world that was heavy on industry – trucks, cars, engines, textile mills, but it was all in decline during the years I was growing up. As they declined though, the motorways grew; fuelling the new economies and service industries in the north west and connecting the region with Birmingham and beyond. In my town, the motorways were also the only reliable source of holiday employment, or rather, the motorway service stations were. I look back on the days with affection – a bit of money coming in; great camaraderie and new friends, plus learning new skills like loading the Hobart conveyor-belt dishwasher at speed or cooking up a mean farmhouse soup from choice cuts and leftovers. The hard truth was though, that as a traveller, these were places of desperation and last resort. Over-priced food and drinks of (at best) medium to low quality, shabby décor, loos abused by the customers, shops no better than a shabby Londis on a back street estate and to cap it all, the most expense fuel on the whole road network. This was 25 years ago too. Sadly, not much has changed. Largely, it’s the same brands. There are more branded franchises now – Costa, the occasional Waitrose or M&S, and recognisable fast food chains. There are new sites too, which always helps raise the bar. But really, it’s more of the same. The fuel remains eye-wateringly expensive; the toilets remain – well, they make it worthwhile repurposing an old 2L coke bottle or crossing your legs for another agonising mile; the food remains of middling quality. At motorway service stations, I’m always left with the feeling that I should be grateful to the operator for providing an essential service. In the last few years, I’ve done some work with leisure operators – restaurants, bar chains, pub operators, as well as multiple food retailers and supermarkets. Their discipline in pushing for clear and recognisable market segmentations has impressed me. This may be pub groups who look for good: better: best offerings (say, ‘Sizzling’, “Hungry Horse’, Pitcher and Piano’). The brands in questions don’t always work but what’s interesting is that those that try and be all things to all men (remember ‘Edwards’ anyone?) have less chance of standing the test of time. The market segmentations help brands adopt a position with greater clarity. So why not in every market? Why not in say, Motorway Service station provision? No – it’s been a race to the middle ground with any segmentation being dictated by the age and investment in the site rather than any attempt to segment between or within sites. At least, until now. And it’s taken an independent company of (current) Cumbrian farmers to nail it. 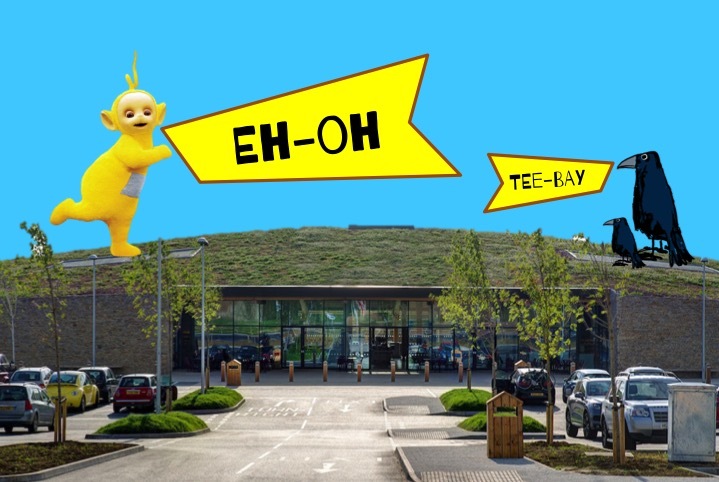 You may have chanced upon Tebay if you’ve driven to or from Scotland on the M6. As you get blown down off Shap Fell, avoiding the snow drifts and wind turbines, there’s Tebay, or to give it its proper name, ‘Westmorland Farmshop’. And now there’s one from the same group on the M5 too, at Gloucester. Physically, comparisons with Teletubbyland have been made, as the buildings have been built to go unnoticed – they nestle curvily into the landscape with a grass-turfed roof. But there’s no laa-laa thinking here. No noo-noo’s just for the sake of it. Indeed, this is just good po-sitioning. This is tangibly a best market position. Gone are the high street fast food franchises, in come a quick serve café focused on local producers. Gone is the dubious restaurant with leftovers soup, instant coffee sachets and plastic sausages and in comes a genuine farmhouse kitchen with a field to fork philosophy. Gone is a shop selling atlases, travel rugs, wet suits (no, really) cheap CDs and random deals on nearly out of date chocolate bars and in comes – you’ve guessed it – a farmshop. Not a pastiche, but the real thing; farmers’ and artisan produce: hand made cards; local ciders and fruit wines, local authors featured, a section for your canine travelling companions and (we’ll have to see how this works) a butchers. Not, note, a ‘shop selling meat’. But a butchers. With a man in a white butcher’s coat, taking down animal carcases and cutting to order. Oh, and beehives. And a dog walking trail. And a picnic site that isn’t a scrap of land sandwiched between the buildings and the slow lane. The prices? Expensive – relatively at least. But relative to the high street or supermarkets not other service stations. In fact, because expectations of good value are so poor for motorway service stations, here it feels like stonking good value. So there’s an old lesson in all of this: think about your offer, your product ranges, your price point break downs. Are you making it easy for shoppers to buy and consumers to consume? Be honest. Where does your brand fit today and what new opportunities are created by it? And can you genuinely create a premium brand or a premium experience? That’s what Westmorland have done. In fact, we should call it the ‘Tebay Test’: Good, better, best, never let it rest. Till your good is better and your better best. Posted in News, Strategy and tagged Farm Shop, Gloucester Services, Good Better Best, Segmentation, Tebay, Westmorland on September 9, 2015 by David Preston. ← Why is it so hard to do a few things, big?